A friend of ours is the pastor of a church which is getting ready for a missions trip to El Salvador. They are going to be working with children, so a group of the women got together on a couple Saturdays and sewed quite a bunch of dresses for little girls sizes 1-10. They also got shorts and shoes for the boys. From the scraps left over after all that sewing, a few of the women who are quilters decided to make a prayer reminder for the church. 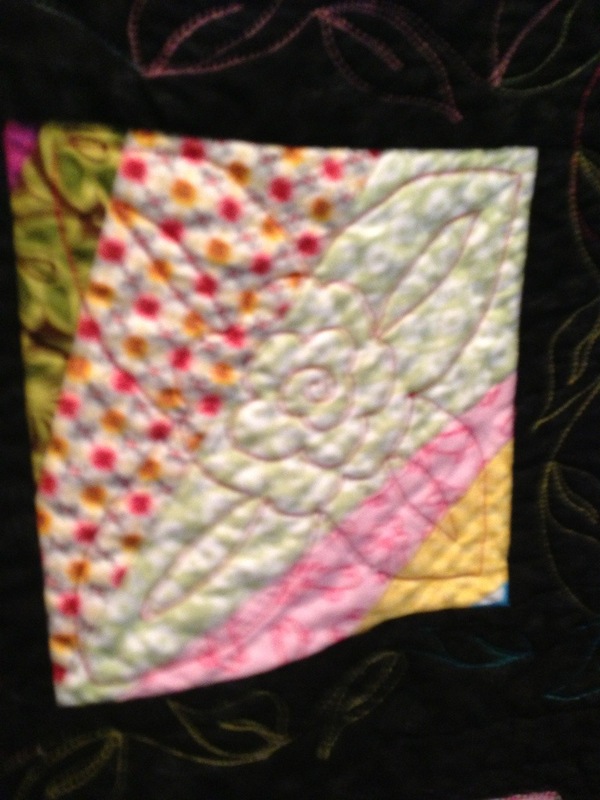 Did you notice all the colorful thread quilting on the black border? I also like the different directions of the squares, and the scrappy look. I am praying for the group going to El Salvador. 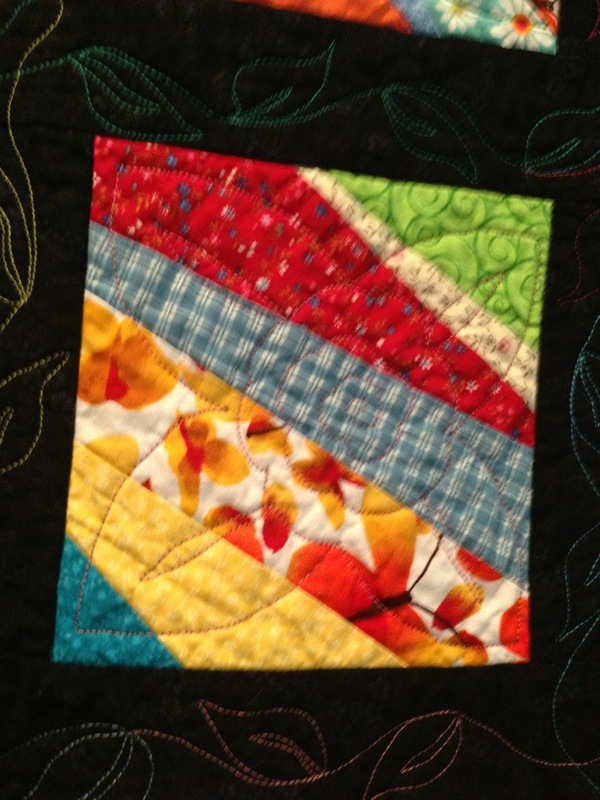 ….and I think I might just make a colorful quilt like this one. I better look for my bag of scraps…not sure where it is after the move! Oh this is lovely. It looks like the bags and clothing that come from Central America — brightly colored with embroidery. And such a good thing to make dresses for the children… If you tell me when they are going, I will pray for them as well. What a great idea to remind the church to pray. And, there are some gorgeous fabrics in that quilt; it makes me smile to think of all those little dresses made out of them. This was so wonderful, Daisy! 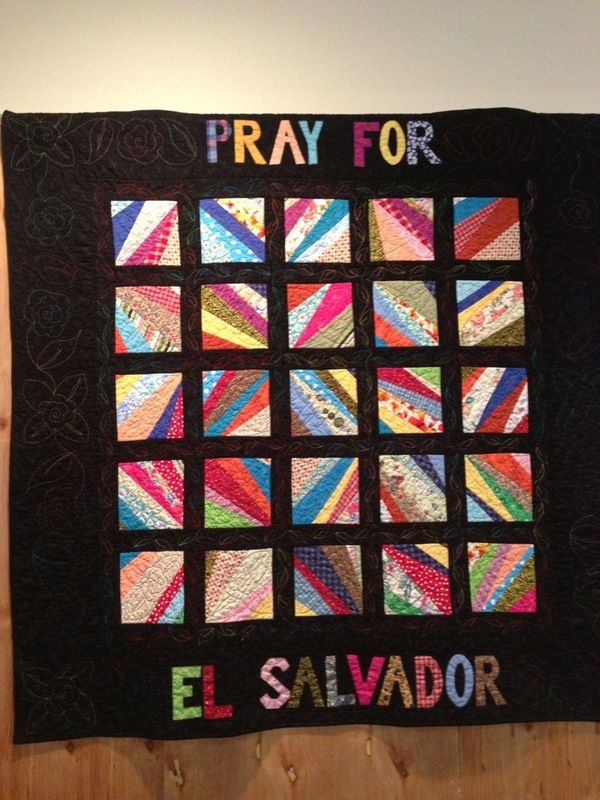 Thank you for sharing that quilt that serves as a prayer reminder too! God bless you! Thank you so much, Debbie! …and may the Lord bless you, too! A wonderful quilt with a wonderful message. I love the idea of using all of the scraps from making clothing to make this quilt. The quilt is beautiful The scraps were put together in such an artistic way–and the colorful quilting really adds to the design. I totally agree! These ladies did a great job! Thank you, Kandy, for that heart-felt comment. You were a blessing to me today. I needed that… especially today. May the Lord bless you as you serve, and may He continue to use you to bless others. This is gorgeous! I like the reason for the quilt and the fact that it is made in the true quilting tradition of using up scraps. Daisy, I hope you find your scrap bag. Haha! Thanks, Wendy! Have a blessed weekend!